We’re going to bet that a bathtub isn’t something you think about too often — except when the time comes to replace your current tub or when you’re doing a bathroom remodel. Then, you’re likely to find yourself thinking about tubs morning, noon, and night. Once you’ve narrowed down the type of tub you want, the next thing to do is find the best tub for your space. 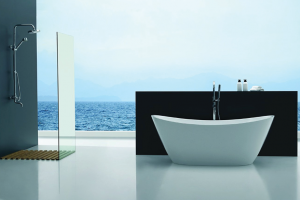 We’ve taken a close look at several models of bathtub available on the market. If you’re thinking of getting an alcove tub for your space, take a look at our picks for the best alcove bathtub. Bathtub material. The American Standard Cambridge bathtub stood heads and shoulders above the rest when it came to material. While all the others were made of acrylic, it was the only model made from a porcelain coated metal. Overall size. Most alcove bathtubs are on the small side, and our picks are no exception. 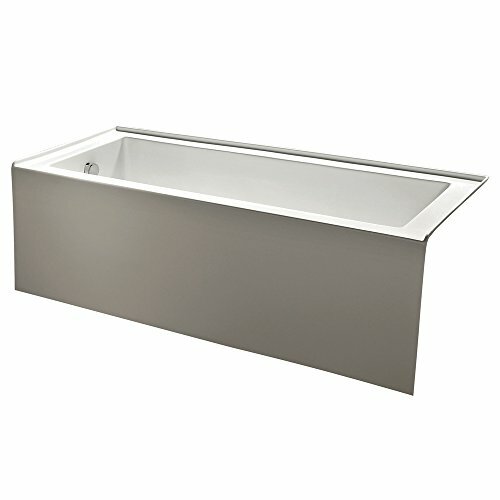 The largest of the bunch was the American Standard 7236V002.020 Evolution Bathtub, which measures 6 feet long and 3 feet wide. Ease of installation. Some models, the Cambridge bathtub and the Kingston Bliss, have included aprons on the exterior side, which makes them easy to install. Comfort features. The two Evolution bathtub models include armrests and backrests, making them more comfortable for sitting and soaking in. 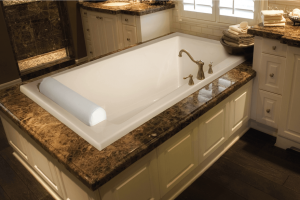 The American Standard Cambridge bathtub features an integral apron and a proprietary material — Americast. The material, which is porcelain enamel coated stainless steel with a composite backing, is meant to be more lightweight compared to porcelain coated cast iron but has the same thickness. The integral apron on the tub means that the side that isn’t connected to a wall is already finished. When the tub’s installed, there’s no need to attach a panel, which saves you a step. The tub itself measures 60 inches in length and 32 inches across. The inside basin is a bit on the small side, measuring just 54 inches wide and 26 inches across. The coating on the tub is designed to reduce and prevent slips, so there’s no need to purchase sticky mats or stickers. 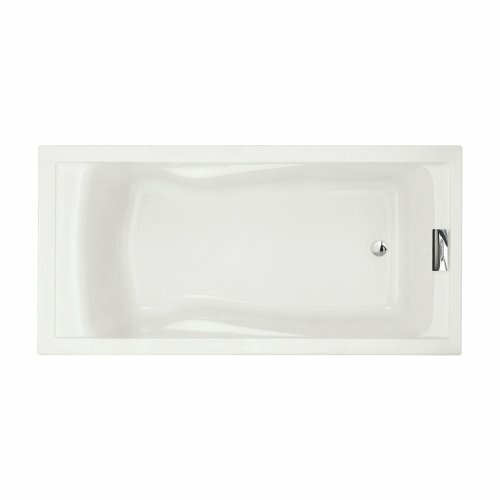 The tub is available in both right-hand drain and left-hand drain models. People who’ve used the alcove bathtub have been pretty happy with how sturdy it is and the fact that it seems deeper than most other alcove tub models (it’s 17 inches deep). Others have been satisfied with the amount of space on the sides of the tub for storing bottles. Lighter than cast iron but not flimsy. The tub is on the small side. Some users have received chipped tubs or tubs with uneven finishes. Who says you enjoy a soaking tub when you have to have an alcove bathtub? The American Standard Evolution Deep Soak Bathing Pool proves them wrong. Although the bathtub measures the same width and length as standard alcove bathtubs — 60 inches by 32 inches — it’s three inches deeper than most, 21 inches deep. The tub is so deep that if you decide that it’s the best alcove bathtub for you, you’ll need to purchase a special Deep Soak Max Drain. To further help you relax while in the tub, it features two armrests on the side as well as a backrest. One potential drawback of the bathtub is its material. It’s made from acrylic, which is lightweight and a good insulator. The big issue with acrylic is that it scratches easily and is easy to damage with some types of harsh cleaners. The bathtub is designed for use as either an alcove bathtub or as a drop-in style. If you use it an alcove tub, you will need to install a separate apron on the side that faces out from the wall. People who’ve used the tub have praised it for being a comfortable soaking tub with a small footprint. Although many people were happy with their tubs, a few noted that theirs had air bubbles in the finish. Deeper than most other alcove tub models. Acrylic can be scratched easily. You need to buy a special drain and an apron to finish the tub. If you’re tall, a standard alcove bathtub is likely to be too short for you to relax in comfort. 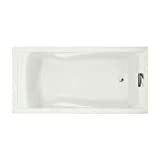 The American Standard Evolution Bathtub is a full foot longer than most alcove bathtubs, making it a good fit for taller people. 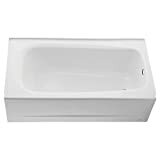 The tub measures 72 inches long and 36 inches in width. It’s also extra deep, measuring 21 inches in depth. If you decide to get this tub, you’ll have to purchase a separate deep soaker drain to accommodate the additional depth of the tub. 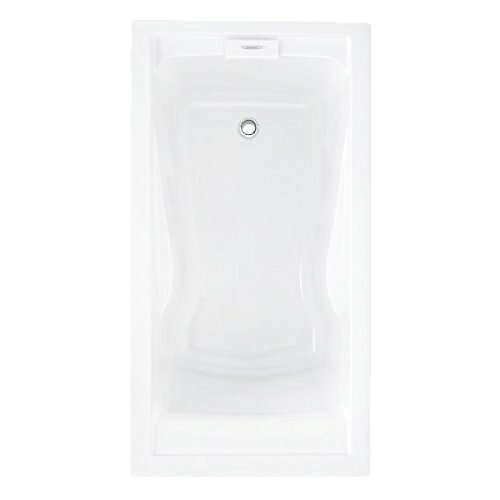 Like the other Evolution deep soaking tub from American Standard, the bathtub doesn’t have an integrated apron, so you’ll need to purchase or install one separately. The tub is made from acrylic, which has its good points and its bad points. It’s lightweight, but you can scratch or damage it easily. People who’ve used the tub have been happy with its overall size. A few of have said that it’s a great tub for soaking in. Larger than average size makes it a good pick if you’re looking to relax in your tub. Has backrest and armrest for comfort. Acrylic material means it’s lightweight. Requires the installation of a separate apron and needs a special drain. It’s easy to scratch the surface of the tub. 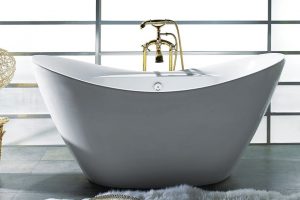 The Kingston Brass bathtub measures just under 60 inches in length and just under 31 inches in width. The water depth to overflow is just under 16 inches. 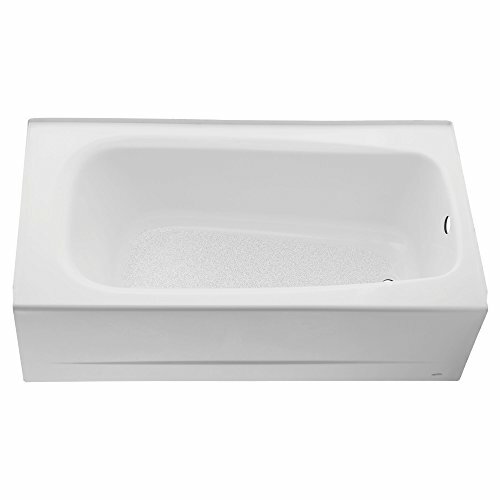 The tub is made from a fiberglass reinforced acrylic, meaning it’s lighter than cast iron models. The entire tub weighs under 100 pounds. The fiberglass coating helps to strengthen the tub and allows it to retain warmth for longer, so you’re not stuck sitting in a cold bath. Unlike the deep soaking tubs from American Standard, the Kingston Brass tub has an attached apron, so it’s ready to go and easier to install. Both right-hand drain and left-hand drain models are available. The big complaint users of the tub had about it was regarding its size. A few noted that it just wasn’t deep enough for them. Others were less than satisfied with the acrylic material, with some pointing out that it did scratch very easily. Those that were happy with the bathtub complimented its sleek style and overall appearance. Others were happy with how easy the tub was to install. Has an attached apron which simplifies the installation process. Fiberglass reinforced acrylic is stronger and better able to retain warmth. The tub is not very deep. The material can scratch easily. Tubs come in a variety of sizes and shapes. The bathtub that’s best for your bathroom depends in large part on your tastes and the size of the room. Alcove bathtubs are a standard tub style. It’s probably the most common tub style, for a few reasons. An alcove bathtub is designed with space-saving in mind. It sits against an alcove in your bathroom, with walls on three sides of the tub. Often, a closet is located on one side of the tub. The best alcove bathtub tends to be on the affordable end of the pricing scale, which is another reason why the style is so common. One potential drawback of an alcove bathtub is that it tends to be on the small side. Standard tubs are about 60 inches long. Some models are up to 72 inches in length, though. On the other side of the length scale, a few models are just 53 inches long. While alcove bathtubs are designed to rest against the walls of a bathroom, some models are meant to stand on their own. A popular model of a free-standing tub is the claw-foot tub. You can climb into it from all sides. While a claw-foot tub might look pretty cool in your bathroom, it comes at a cost — literally and figuratively. 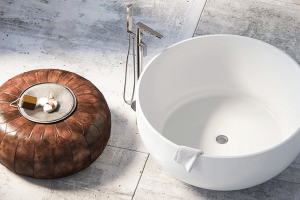 Claw-foot tubs tend to cost a lot more than alcove bathtubs. They also require a larger amount of space compared to alcove tubs, since you not only need room for the tub, you also need space to access it from all sides. A drop-in tub is another type of free-standing tub. Usually, a drop-in tub rests in a deck, which can be made from wood, stone or another material. True to its name, the tub is “dropped in” to the deck, which supports it on all sides. One more type of tub: the corner tub. Similar to an alcove bathtub, a corner bathtub has walls on two sides of it. Unlike an alcove bathtub, a corner tub is usually on the large side is and designed for long, relaxing baths. 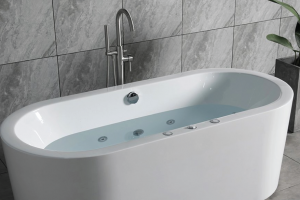 With so many types of tub to choose from, how do you know which one is the best one for you? There are a few things to keep in mind. The size of your bathroom. Smaller bathrooms might only have enough room for the best alcove bathtub. Your budget. The larger and more luxurious your bathtub, the more it’s going to cost. Alcove tubs tend to be the most budget-friendly. How you’ll use the tub. Let’s be real here — you can’t sit back and soak for hours in an alcove bathtub. If you want a soaking tub, you’re going to want to look at drop-in or corner tub models. Do you need a shower? While some bathtubs come with shower attachments, you’re not going to get that feature with certain types of free-standing tubs. Speaking of showers, that’s another thing to consider when remodeling your bathroom — whether you need a bathtub at all. More and more, people are skipping the tub and choosing a standalone, walk-in shower. But a bathtub has its benefits, especially if you have kids or pets. Another benefit of an alcove bathtub is that you can use it to wash some types of clothing or to rinse off some types of sporting equipment. Depending on where you live, choosing to install a tub instead of just a shower can also help you when it’s time to sell your house. 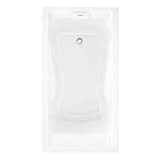 When it comes to choosing the best alcove bathtub, we’re going to name the American Standard 2461.002.020 Cambridge 5-Feet Bathtub the winner. The tub might not win any design contests, but it’s a good, no-frills pick of an alcove bathtub. We liked that it was the only tub in our roundup made from a sturdy, coated metal rather than acrylic. It’s also a pretty good space saver, measuring 5 feet by less than 3 feet. Sometimes, you want a tub with bells and whistles. Other times, you want something that will get the job done. While the American Standard Cambridge bathtub isn’t going to win any beauty contests, it’s sturdy and reliable enough to earn a spot as the best alcove bathtub.